The pertussis titer checks for whooping cough immunity in the blood. What is a pertussis titer? The pertussis titer measures pertussis IgG antibody blood levels. Why is a pertussis titer important? The pertussis titer checks for evidence of immunity to whooping cough in the blood. This Pertussis Titer is a blood test. The pertussis titer, also known as a pertussis immunity blood test, whooping cough blood test, and whooping cough immunity test, measures the pertussis titer antibody blood level. Bordetella pertussis is the bacteria that causes pertussis, or whooping cough. Pertussis is a highly contagious infection that is spread through droplets from an infected person. Pertussis symptoms include a runny nose and a fever. The name whooping cough comes originates from the gasping noise ("whoop") that occurs when a person breathes in after a coughing fit during a whooping cough infection. While symptoms can resolve within a few weeks, some people experience the coughing symptoms of pertussis for eight weeks or more. While many healthy people simply experience a persistent cough after a pertussis infection, infants, children and the elderly are susceptible to severe complications such as pneumonia and neurological complications such as seizures. 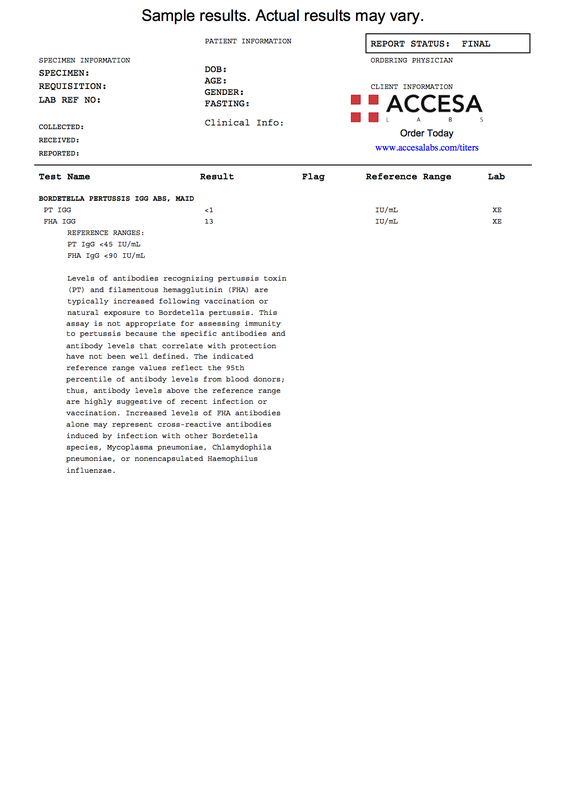 This pertussis titer checks for IgG antibodies to Bordetella pertussis. Following successful vaccination, pertussis IgG antibodies can be demonstrated in all people except for infants. The pertussis titer is frequently ordered with the tetanus and diphtheria titer in a combination known as the Tdap titer. The pertussis immunity test is often ordered by students and healthcare workers who need it for credentialing requirements. To get a pertussis titer near you, order online and get tested at the Quest Diagnostics lab that you selected. Once your pertussis lab test report is ready, it will be available for download. As can be seen on the sample pertussis lab report above, the pertussis IgG antibody blood level will be reported as a number and can be compared against the reference range provided by the lab. Our pertussis immunity test provides quantitative pertussis IgG antibody results and a positive pertussis immunity blood test usually means that one is considered immune to Bordetella pertussis. In addition to common preventative tactics like hand washing and minimizing contact with infected people, the pertussis vaccine can help reduce the likelihood of getting the whooping cough. The pertussis vaccine (the "p" part of the Tdap) protects against pertussis by creating antibodies against the whooping cough in the immune system. Immunity to pertussis typically does not typically last for life after vaccination and the pertussis titer test can be used to confirm one's current whooping cough immunity. Pertussis Titer at Guaranteed Prices.